If you want room-filling sound without the hassle of lots of speakers, Yamaha's MusicCast BAR 400 is an elegant solution. 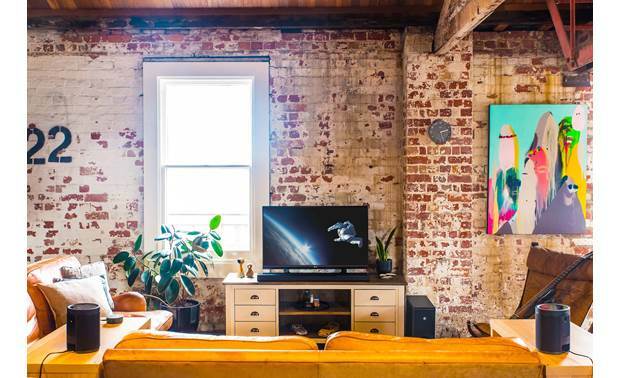 Its low profile and streamlined design will slip easily into your home's decor, but the upgrade to your TV's audio will definitely make an impact on your binge-watching game. Yamaha's MusicCast BAR 400 is compact in size, but it is chock-full of features. Clear Voice processing brings speech to the forefront so that dialogue is easier to hear and understand, while DTS Virtual:X digital signal processing broadens the soundstage for an even more immersive cinematic experience. The included sub has a 6-1/2” woofer to add low-end punch to your movies, shows, and music. Plus it's wireless — so you can park it in the most convenient and best-sounding spot. Just remember that it needs AC power. Many sound bars simulate Dolby Atmos or DTS:X by bouncing sound off your walls and ceiling. That's not what's happening here. DTS Virtual:X uses "spatial audio techniques" to make it seem like the sound is all around you. Incredibly sophisticated audio delays and adjustments create a larger, wider soundstage. That includes overhead atmospheric effects like leaves rustling on a tall tree or birds chirping above. Virtual surround sound has come a long way, but there's just no substitute for the real thing. So if you want an even more immersive experience, you can add one or two MusicCast 50 speakers or a pair of MusicCast 20 speakers behind your viewing area to deliver complete wraparound sound effects. The MusicCast BAR 400 offers a variety of options for streaming your content, including Bluetooth®, Wi-Fi®, Apple® AirPlay®, and Spotify® Connect. It even supports high-resolution audio formats up to 24-bit/192kHz. And it's easy to select and control your music using the free Yamaha MusicCast app. MusicCast uses your existing Wi-Fi network to stream music wirelessly throughout your home. Expand your system by adding compatible speakers, and you can play different music in each room, or group your speakers so they all play the same thing. The system is also Alexa-compatible, so if you have an Amazon Echo device, you can control it with your voice. Quality product. I have the Yas 207 and this is definitely an upgrade from that unit. The 400 has much more power and sound quality, it really fills the living room. Do I need a receiver? Active Soundbar Speaker: The Yamaha MusicCast Bar 400 (YAS-408) active soundbar speaker features a 2ch driver configuration with one 1" dome tweeter and two 1.75" mid-woofers for each of the left & right channels (for a total of two 1" tweeters and four 1.75" mid-woofers). 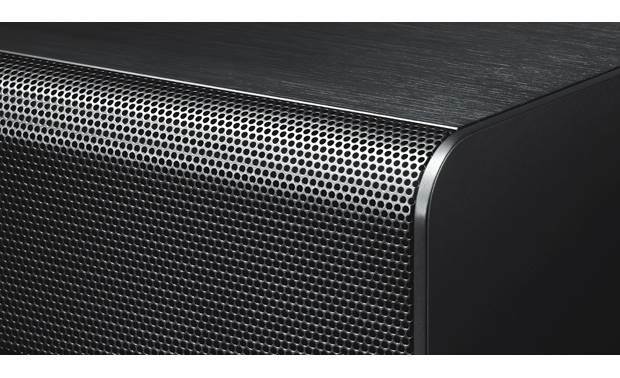 The active soundbar speaker utilizes a 50 watt x 2 channel amplifier to power the enclosed drivers for a 100 watts of total power. 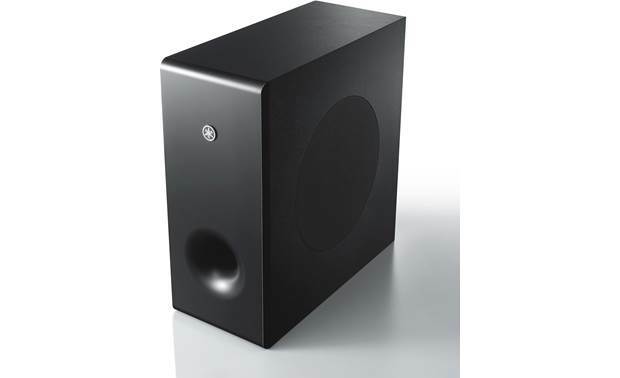 Wireless Powered Subwoofer: The Yamaha MusicCast Bar 400 (YAS-408) includes a wireless powered subwoofer that features a side-firing 6.25" woofer powered by a built-in 100 watt amplifier for dynamic bass response. A front-firing port aids in deeper, bigger bass response. 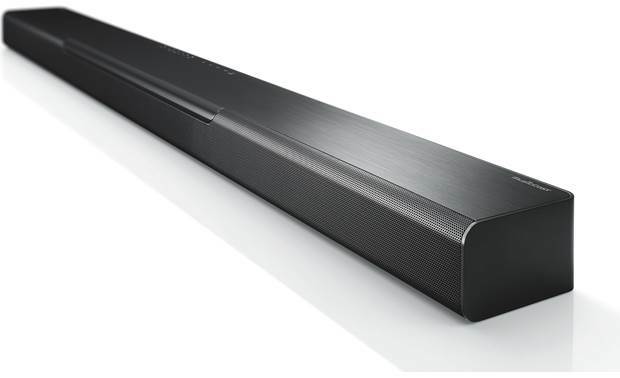 Since the powered sub is wireless, you don't have to connect a cable between the soundbar and the sub (you still will need to plug the sub's AC power cord into a wall). The powered sub's wireless range is 33'. 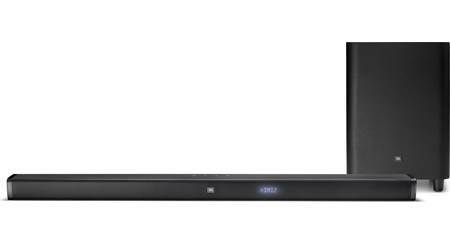 Dolby Digital & DTS Compatible: The Yamaha MusicCast Bar 400 (YAS-408) soundbar decodes 2ch PCM, multi-channel PCM, Dolby Digital, & DTS audio signals. You can listen to these audio formats in a virtual surround mode or a 2ch stereo mode. The 2ch stereo mode is ideal for music, while the virtual surround mode provides a much more immersive soundfield for movies. 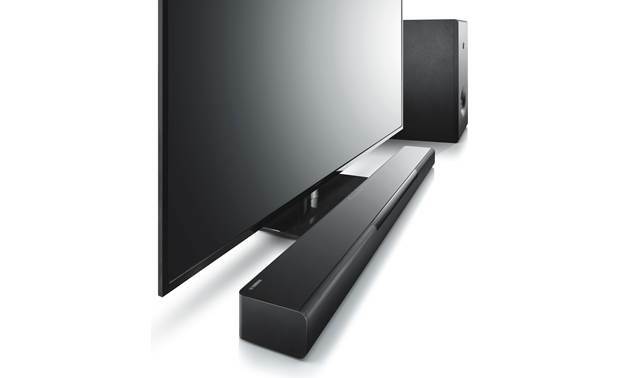 DTS Virtual:X + 3D Surround: The Yamaha MusicCast Bar 400 (YAS-408) can deliver immersive 3D surround sound, simulating sound effects that seem to move around the listener and even have a sense of height. 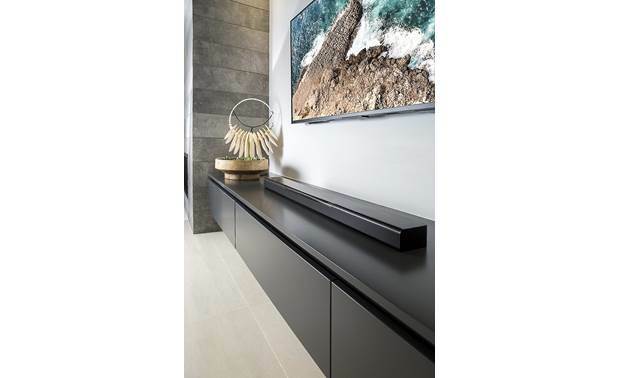 Thanks to DTS Virtual:X & 3D Surround the MusicCast Bar 400 (YAS-408) allows surround sound to be heard not only from horizontal directions, but also from varying heights. DTS Virtual:X can be used with any content (from 2ch to 5.1ch soundtracks), while delivering virtual height & virtual surround processing based on psychoacoustics (not reflective surfaces). Ideal for use with any multichannel content (including DTS- and Dolby-encoded soundtracks) it creates more spacious, lifelike sound for all of your favorite TV shows, movies and games. Audio Enhancements: The Yamaha MusicCast Bar 400 (YAS-408) offers a variety of audio settings to enhance your listening experience, so you can enjoy your movies and music even more. Surround Presets: From Yamaha's free MusicCast Controller app on your Apple iOS or Android device you can select between different surround modes - TV Program, Stereo, Movie, Music, Sports, & Game. Or, you can simply select a 2ch stereo mode. Wireless Surround: You can combine the MusicCast Bar 400 (YAS-408) with a pair of MusicCast 20 (WX-021) speakers, a pair of MusicCast 50 (WX-051) speakers, or a single MusicCast50 (WX-051) speaker and enjoy the convenience of creating a home theater system with wireless rear speakers in a 4.1-channel configuration. From the MusicCast Controller app you can adjust the distance and level of each surround speaker. The MusicCast Bar 400 (YAS-408) and the MusicCast 20 (WX-021) or MusicCast 50 (WX-051) speakers must be on the same wireless network. Analog & Digital Audio Inputs: The Yamaha MusicCast Bar 400 (YAS-408) is outfitted with both analog & digital audio inputs to connect to your TV. There is one optical (toslink) digital input that supports 2Ch PCM, 5.1ch Dolby Digital, and 5.1ch DTS audio signals (up to 24-bit/32-48kHz). There is also one stereo minijack (3.5mm) audio input for televisions without an optical digital out. Bluetooth Audio: The Yamaha MusicCast Bar 400 (YAS-408) offers built-in Bluetooth 4.2 for wireless music streaming (A2DP) & control (AVRCP). This allows you to stream stored music, music apps, and other audio content on your Bluetooth-enabled source devices (such as your smartphone, tablet, desktop computer, or laptop) to the MusicCast WX-021 speaker. The speaker has a wireless Bluetooth range of approximately 33'. SBC + AAC Codecs: In addition to support for the standard SBC Bluetooth audio codec, the MusicCast Bar 400 (YAS-408) speaker offers support of AAC. By supporting AAC, the MusicCast Bar 400 (YAS-408) offers better audio performance of the music streamed from your Apple iOS device. Multi-Device Pairing: The MusicCast Bar 400 (YAS-408) can be paired with multiple Bluetooth source devices, but only one device can be connected and used at a time. If one or Bluetooth devices had been connected to the speaker before, the speaker will automatically connect to the last connected device when Bluetooth is enabled. Note: The MusicCast Bar 400 (YAS-408) does not support Bluetooth hands-free communication for making and answering phone calls. ARC (Audio Return Channel): This feature of the Yamaha MusicCast Bar 400 (YAS-408)'s HDMI output allows audio to be sent from your compatible TV to the soundbar through the same HDMI cable already being used to send audio and video to your TV. This eliminates the need for extra cables connected to your television. Note: The ARC-enabled HDMI input on some TVs will only pass 2ch PCM from devices connected to the TV via HDMI or analog, so we recommend that you connect your Blu-ray player or Satellite/Cable box to the Yamaha soundbar directly; and then connect the MusicCast Bar 400 (YAS-408)'s ARC-enabled HDMI output to your TV's ARC-enabled HDMI input. This setup will give you with the best overall sound performance. HDMI 2.0b: The Yamaha MusicCast Bar 400 (YAS-408) is outfitted with one HDMI input and one HDMI ARC output that support the latest HDMI 2.0b specifications; including 4K/60Hz, HDCP 2.2, HDR (High Dynamic Range), 4:4:4 color subsampling, & Wide Color Gamut (BT.2020) for full support of today's 4K content from Ultra HD Blu-ray & online video services (like Amazon & Netflix). 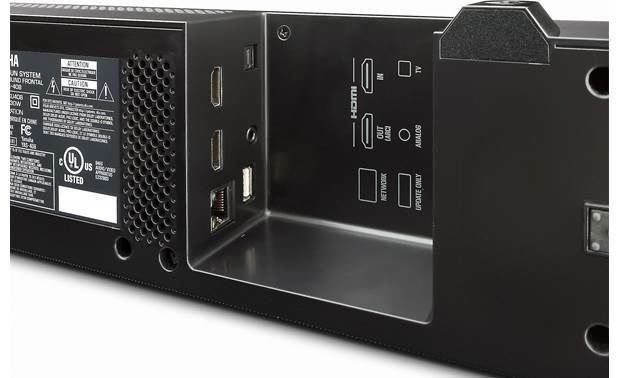 4K/60Hz + HDCP 2.2: The MusicCast Bar 400 (YAS-408) supports up to 4K (3840x2160 pixels) video @ 60 frames per second through its HDMI input and output. It also supports a 480i, 480p, 720p, 1080i, or 1080p video signal. The HDMI input and output also support HDCP 2.2, which fully complies with the latest copyright protection standard for 4K video transmission. HDR (High Dynamic Range): The Yamaha MusicCast Bar 400 (YAS-408) supports HDR (high dynamic range) Video - including HDR 10, Dolby Vision, and Hybrid Log-Gamma. HDR (High Dynamic Range Video) provides enhanced picture quality by simultaneously enabling greater detail for both the dark and bright parts of an image. HDR reproduces a greater dynamic range of luminosity or brightness levels, creating greater contrast. This increased contrast reveals the subtle nuances of the image, from detailed blacks and shadows to the brightest whites and colors, plus greater depth. HDR 10: HDR 10 is an open standard and currently the most popular HDR format on the market. It uses static metadata at the start of a movie to tell the soundbar system and your TV that the video content is encoded using HDR. Other HDMI Features: The Yamaha MusicCast Bar 400 (YAS-408) also offers 3D video pass-through, Deep Color & x.v.Color support, as well as an auto LipSync function via HDMI. 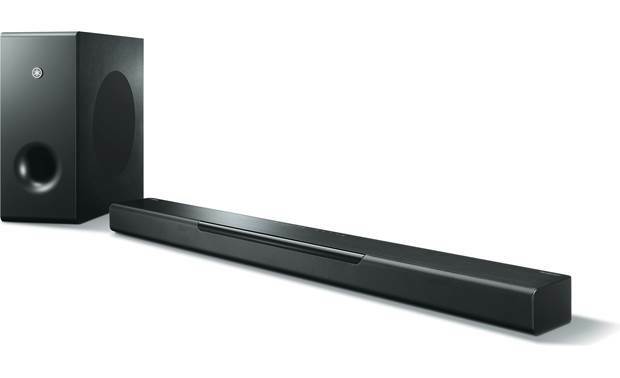 3D Ready: The MusicCast Bar 400 (YAS-408) soundbar supports 3D video pass-through (720p/1080p only) from connected 3D-compatible Blu-ray, games and broadcast devices to 3D-compatible HDTVs (all 3D components must be connected via HDMI). Special eyewear will be required for viewing 3D content. MusicCast: The Yamaha MusicCast Bar 400 (YAS-408) is part of Yamaha's MusicCast multiroom audio eco-system. MusicCast from Yamaha, brings music to every room in your home wirelessly with control provided by the free MusicCast Controller app for Apple iOS 10.0+ and Android OS 4.1+. Designed to easily work with your existing home WiFi network, MusicCast offers access to a wide range of audio content from your downloaded music library, Internet radio, and select online music services. MusicCast is enabled on many 2015-up Yamaha components like their AV receivers, wireless speakers, soundbars, and other HiFi components. Wired or Wireless Network Connection: With MusicCast you can choose to build a wireless or wired network, or a combination of both if desired. The Yamaha MusicCast Bar 400 (YAS-408) supports both wireless and wired network connectivity through its built-in dual-band (2.4/5GHz) WiFi (802.11 a/b/g/n/ac) and wired Ethernet (RJ-45) port. Network setup is completed through the free MusicCast Controller app on your compatible Apple iOS or Android device. High Resolution Audio: The MusicCast Bar 400 (YAS-408) supports true high-resolution audio formats to deliver more accurate reproduction of sonic details. 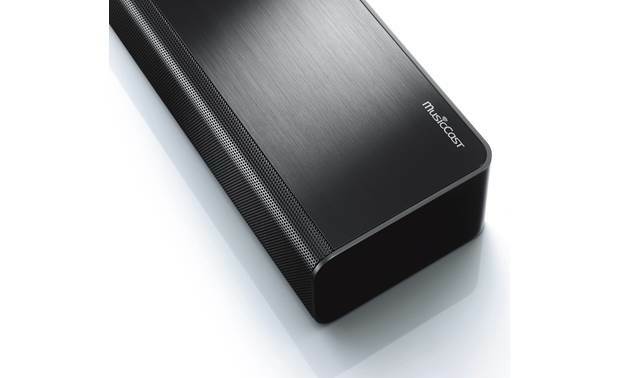 The MusicCast eco-system is compatible with high resolution FLAC, AIFF and WAV music files up to 192kHz/24-bit; as well as Apple Lossless (ALAC) up to 96kHz/24-bit. It also supports lower resolution music files like MP3, WMA, and AAC up to 48kHz. 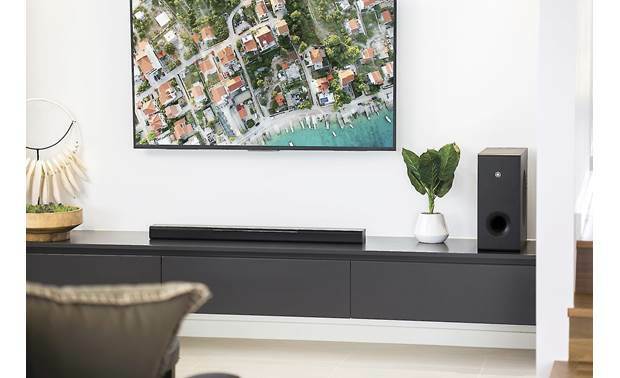 Multiroom Audio: Start with the Yamaha MusicCast Bar 400 (YAS-408) in your living room or bedroom and add other MusicCast products from Yamaha (like wireless speakers, AV receiver, and HiFi components) over time to create a multiroom audio, whole-house experience. Up to 10 MusicCast devices can be connected. You can play the same audio source throughout your home or different audio sources on grouped MusicCast components. DLNA: The MusicCast Bar 400 (YAS-408) speaker supports DLNA (Digital Living Network Alliance) 1.5, allowing access to DLNA-compatible Windows 7/8/10 computers (with Windows Media Player 11 or 12) and network attached storage (NAS) devices. You'll be able to wirelessly stream the music libraries on your computer, laptop, or NAS to the Yamaha MusicCast speaker system. AirPlay: AirPlay lets you stream your favorite songs directly from your Apple iOS (4.3.3+) device or from your iTunes (10.2.2+) library on your Windows PC or Mac computer to the Yamaha MusicCast Bar 400 (YAS-408) speaker, over your home's WiFi network connection. From your Apple iOS device you are able to stream stored music and music apps on your device to the Yamaha MusicCast speaker. From your Windows or Mac you can stream your stored iTunes music library on your computer to the MusicCast speaker system. Source Selection: From the app you can select which source or sources you want to listen to. Choose from network-connected devices (such as your Apple iOS/Android device or DLNA server); select online music services, Internet Radio or Bluetooth, as well as analog & digital audio inputs (including HDMI). You can even select a AM/FM ratio station from a MusicCast AV receiver. Alexa Compatible: Alexa-enabled devices (sold separately - see Accessory Tab) are able to control key functions of a MusicCast system using voice commands. With Alexa voice control integration, all you have to do is ask. The MusicCast Bar 400 (YAS-408) offers full compatibility with Amazon's range of voice control devices. Yamaha offers two Alexa Skill platforms that work hand-in-hand to give you a wide range of voice command possibilities, allowing you to control either a single MusicCast product or a whole MusicCast system. The MusicCast system and Alexa-enabled devices must be on the same WiFi network. 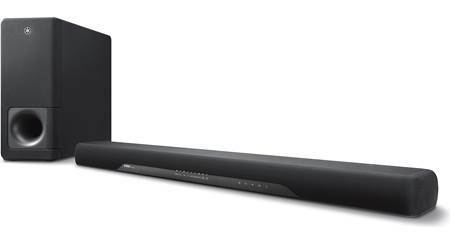 IR Remote + HDMI Control: The Yamaha MusicCast Bar 400 (YAS-408) comes with an easy-to-use IR remote control for wireless operation of the soundbar speaker system. Also, if your TV supports HDMI CEC and uses HDMI connectivity, it is possible to control many functions of the soundbar system using your TV's remote to simplify day-to-day operation. HDMI Control functions include Power On/Off, Input Source Selection, and Volume Up/Down. Top-Panel Controls: The Yamaha MusicCast Bar 400 (YAS-408) features the following top-panel controls - Power On/Off, Input Select, Volume Up/Down, and Mute. 3 Preset (Favorite) Buttons: Three preset (favorite) buttons give you one-touch access to your music favorites (save a favorite music playlist, online music service, or Internet radio station). Simply press and hold the preset buttons (1/2/3) to store a music source. The 3 preset buttons are located on the IR remote control (not with top-panel controls). Tabletop or Wall-Mount The Soundbar: At only 2.375" tall, the soundbar fits neatly in front of most TVs or can be placed on the shelf of a TV stand. The built-in keyholes (18" apart) make it easy to wall-mount with a sleek look that perfectly complements almost any flat-panel TV. Sound equalization is automatically adjusted for tabletop or wall mount orientation. Flexible Placement for Wireless Sub: The wireless powered subwoofer eliminates the need to connect cables, so setup and placement are faster and easier. You will still need to connect the powered sub's power cord to an AC outlet. 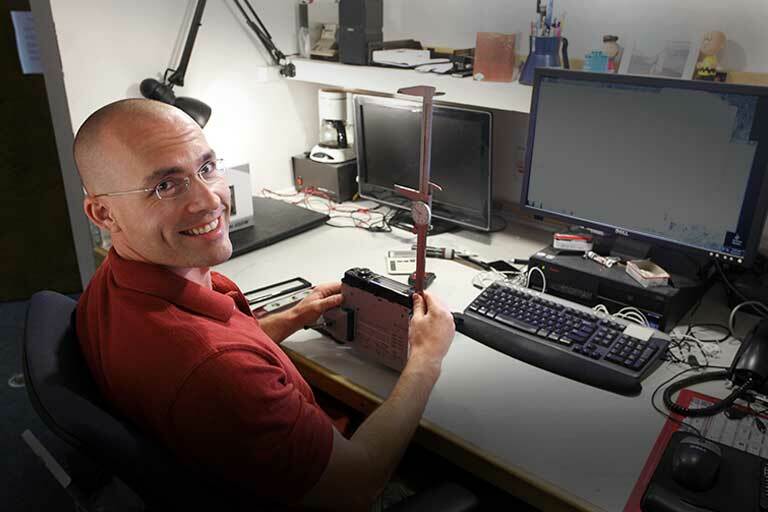 The wireless sub can be positioned almost anywhere in the room (up to 33'). For best performance, it should be placed on the same wall as the soundbar. 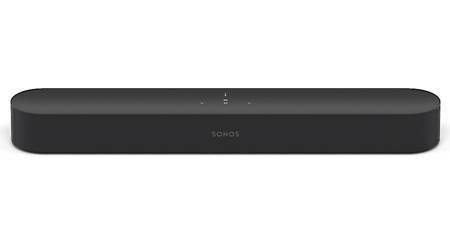 Power Requirements: The active soundbar speaker and wireless powered subwoofer will need to be plugged into an AC wall outlet, surge protector or power conditioner (sold separately). Each comes with a detachable 6' AC power cord. 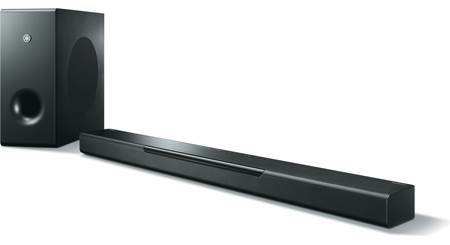 Searches related to the Yamaha MusicCast BAR 400 (YAS-408) Powered sound bar with Wi-Fi®, Bluetooth®, and wireless subwoofer.